The Coral Reef Laboratory is a fully established system for coral experimentation. The laboratory team propagates and studies more than 40 species of cnidarians in a multi-compartment mesocosm circulating ~12500 litres of artificial seawater. The laboratory hosts representatives of actiniaria, ceriantharia, octocorallia, corallimorpharia and sclearactinia. 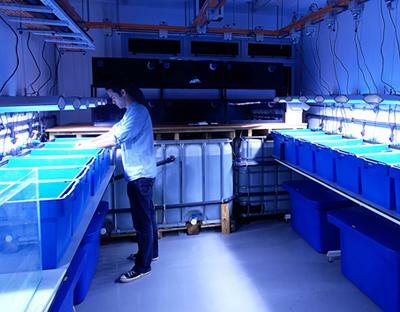 The facilities of the Coral Reef Laboratory consist of a coral nursery facility in which replicate colonies of corals are produced for experimental purposes and an experimental aquarium facility for long-term experiments with reef building corals. 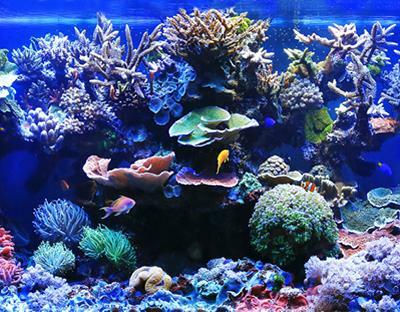 The aquarium system allows experimentation under tightly controlled conditions. It also includes the Coral Reef Tank in the reception area of NOCS. • Applying genomic, proteomic and lipidomic approaches to understand the response of reef corals to environmental stress. • Studies of molecular adaptations of heat stress tolerant corals. • Assessing the influence of the nutrient environment on the coral bleaching. 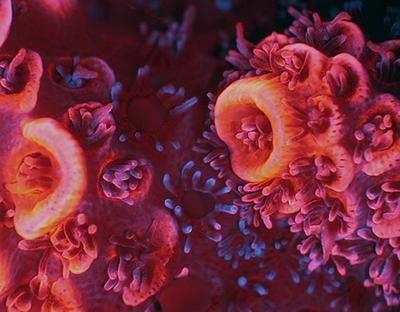 • Evolving fluorescent reef coral pigments into advanced imaging tools for biomedical reserach. • Studying the role of coral pigments in the photobiology of hermatypic corals and their symbiotic algae. • Exploring the function of fluorescent proteins in deep-water and azooxanthellate invertebrates. • Field studies to complement the laboratory experimentation. 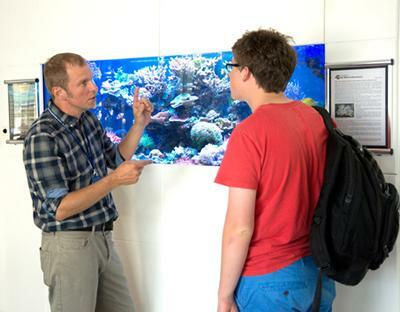 The NOCS Coral Reef Tank is situated in the reception area of the National Oceanography Centre Southampton (NOCS). It is a combination display, research and teaching aquarium dedicated to demonstrating our commitment to public access and engagement about marine science. The NOCS Coral Reef Tank is maintained by a team lead by Prof Jörg Wiedenmann and circulates more than 2200 litres of artificial sea water with the display tank holding 600 litres. The corals on display are propogated entirely in-house. • To provide a sustainable supply of corals for research purposes. • To enhance the learning experience of students by providing a living display of organisms relevant to their courses. • To contribute to the conservation of endangered species.